Have you ever wanted to just say no? (That’s a bad question, of course you have!) I mean say no to the whole Christmas overwhelm? I’m sure you’ve toyed with the idea just a little. Sure there’s something magical about this time of year, and the joy of giving lights something up inside us, but this year maybe you have a reason to give gifts a second thought. You want to be more minimal. Maybe it’s that episode of Hoarders you watched last week, but all of a sudden you’re realizing that you don’t want to accumulate a bunch of Santa mugs and reindeer onesies. You’d rather save money. Maybe your group of friends has been growing or you’ve all been one-upping one another. Maybe you would just rather start the new year with a little more money in the bank. A shopping spree for seventy-two snowman ornaments doesn’t exactly help. Shopping is overwhelming. For years you’ve always been able to find that perfect gift. One that they both want and need. Now, you find yourself saying “what the heck do I get?” not to mention your circle of family and friends seems to be expanding making you question if you should have started shopping back in July. I know, I know. My proposal may seem radical. This isn’t for everyone, but there are plenty of reasons to reconsider this whole gift exchange tradition. “We are saving up for a house, and we don’t want to partake in gift exchange this year.” Nobody can argue when you have a clear goal. 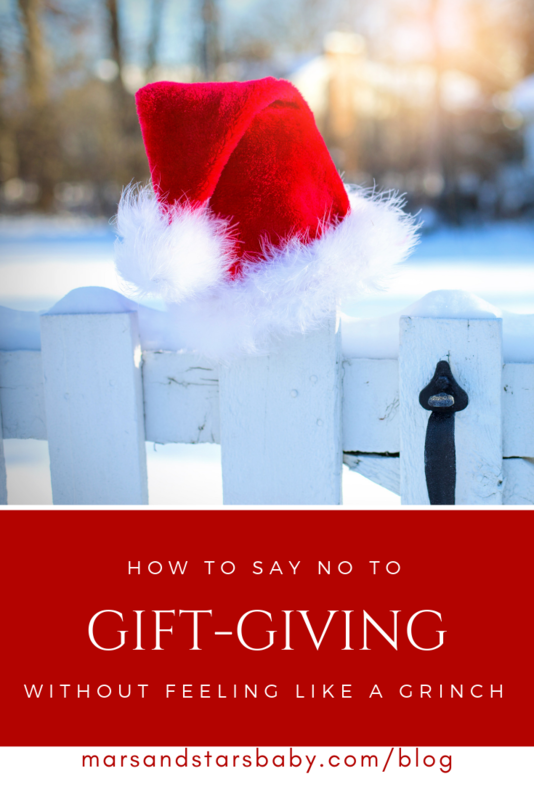 If you are wishy-washy on your WHY, your friends and family will try to “help” you make it work by ignoring your wishes and proceeding with gift exchanges anyway. Not to mention, if you’re not clear in your own head, you’re likely to falter and succumb to the pressure anyway. These days my husband and I say “We are working on a more minimal lifestyle, and we don’t want to add things to our home right now.” This doesn’t resonate with everyone, but everyone respects when you stand by your WHY. Since we are clear on our “minimalist” policy, we are more than happy to exchange gifts that won’t take up space in our house. Namely, experiences. This could mean tickets to Ripley’s Aquarium, or a dinner out with the family. We also exchange “favor” gifts like babysitting or help with a reno. This is great for a large family or group of friends. You only give one gift and you only get one gift – so make it a good one. Secret Santa works by drawing a name out of hat and buying a present for just that person. This is the best of both worlds. You still get to partake in the spirit of giving, but you don’t have to go overboard. Obviously, this won’t work for every family, but you could combine it with any of the tips above. Maybe the kids get their own Stealing Santa as do the adults. Or the kids get toys and the adults get experiences. I’m sure you can find a way to make it work without making it overwhelming. So if you want to say no to gift exchange this year without feeling like a Grinch, try one of the tips above, and let us know how it goes on instagram @marsandstarsbaby.